This productivity suite was especially created to fulfil a niche market in the upcoming user-migration from desktop to the laptop and tablet PC segments. The interfaces have been optimised to be Touch-Device friendly for easier access and operation. Version 2.6.6.6 is a freeware program which does not have restrictions and it's free so it doesn't cost anything. 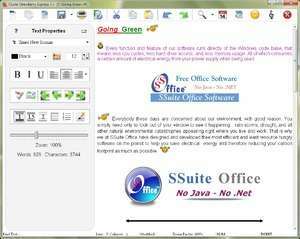 For security reasons, you should also check out the SSuite Lemon Juice download at LO4D.com which includes virus and malware tests. Additional screenshots of this application download may be available, too. 3.2 out of 5 based on 35 ratings.